Fort Wilderness Resort & Campground did not open on 1 October 1971 with the rest of Walt Disney World. After a few weeks, Fort Wilderness finally opened on 19 November 1971 with a compliment of 131 campsites. A western settlement, swimmin’ hole, and locomotive, along with more campsites and eventually cabins, turned the pines and marshes of central Florida in a living and breathing Frontierland that guests could actually reside in, if only for a few days. 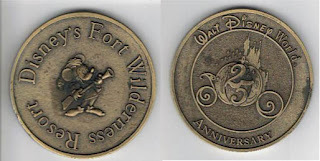 In 1996, alongside the rest of Walt Disney World, Fort Wilderness Resort & Campground celebrated its 25th anniversary. To commemorate the event, like so many other Disney milestones, a coin was issued. Though the train, most of its tracks, the underbrush, and River Country have long since pulled up stakes, Fort Wilderness still carries on the spirit of the frontier. A lot has changed since those early days, but as we celebrate its 37th anniversary, I think we have a lot more good things to come in this often overlooked corner of Walt Disney World.